Our light table sits outside the classroom in the hallway. It is a small area that hosts no more than three children at a time. However, the engagement involved is enormous. Throughout the year, we rotate new tools and manipulatives for exploration. 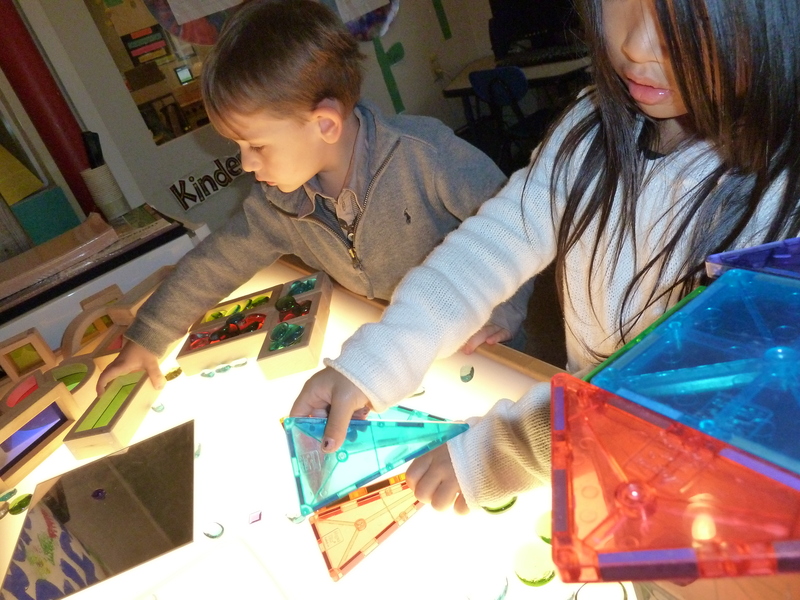 Currently, the children have been using Magna-Tiles, glass pebbles, and colored window blocks. The Magna-Tiles allow the children to defy gravity in ways that regular wooden blocks would never permit. Buildings have turrets bursting from their sides and triangular columns are a common architectural detail. Long rows of blocks, stuck end-to-end with a magnetic force, can easily be moved along in snake life fashion giving new form to a design. lighttable from Bess Forst on Vimeo.